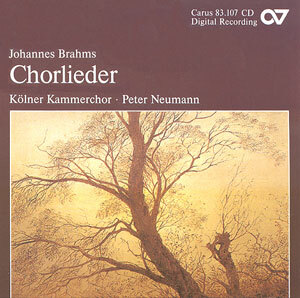 Brahms wrote many choral compositions that are rarely performed but are of the highest musical quality. These include motets, a cappella songs, canons, and folksong arrangements, and such as “The Song of Destiny, Nanie”, and the celebrated “German Requiem”. Many of the composer's late choral works are very polyphonic and their style recalls early baroque madrigals. Brahms's frequent activities as a choral conductor undoubtedly gave him opportunities to perform these compositions. The Opus 42 a cappella choral songs are among his earliest in that genre; the folksongs for solo singer plus chorus date from 1894 and are among his la test. (Brahms made folksong arrangements all his life.) The Opus 92 quartets were originally written for four solo singers with piano accompaniment but Brahms did not discourage choral performances. Finally, the Opus 62 songs, again unaccompanied, were published in 1874 when the composer was conductor of the Vienna Singverein, and they are based on texts from “Des Knaben Wunderhorn” and Heyse's “Jungbrunnen” (Youth Fountain), and are written in folksong style. The Cologne Chamber Chorus numbers between 20 and 45 voices, depending on the work. They sound well-tuned and they sing with much beauty of tone, enthusiasm (where warranted), and commitment. Their diction is quite good too; but while all the texts are printed in the booklet, there are no translations. (The liner notes and bios are printed in three languages!) If you can live with that, I urge you to buy this off-the-well-trodden path release. It should give music-lovers much enjoyment, though it could easily have been longer.